With our recent Siberian-like weather, An Invitation to the Garden arrived at my door like a welcome breath of spring. 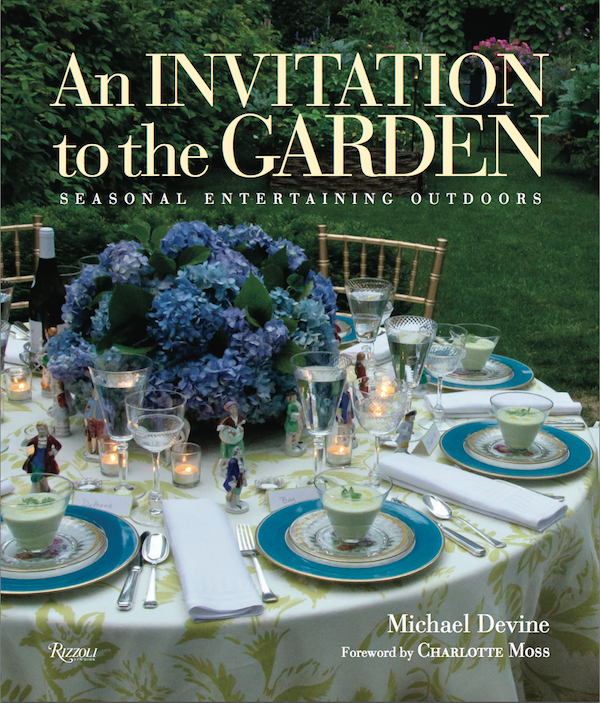 Authored and photographed (with John Gruen) by multi talented friend Michael Devine, the volume transports you to his charming garden in upstate New York where he has created twelve enchanting seasonal events with 50 approachable recipes. An entertaining guide with both inspirational and practical information, Michael shares menu, floral and presentation tips that can be adapted to any space. Whether you have an ample country garden or grow herbs on an apartment windowsill, you’ll be chomping at the bit to plan your next dinner party with all the creative ideas inside. 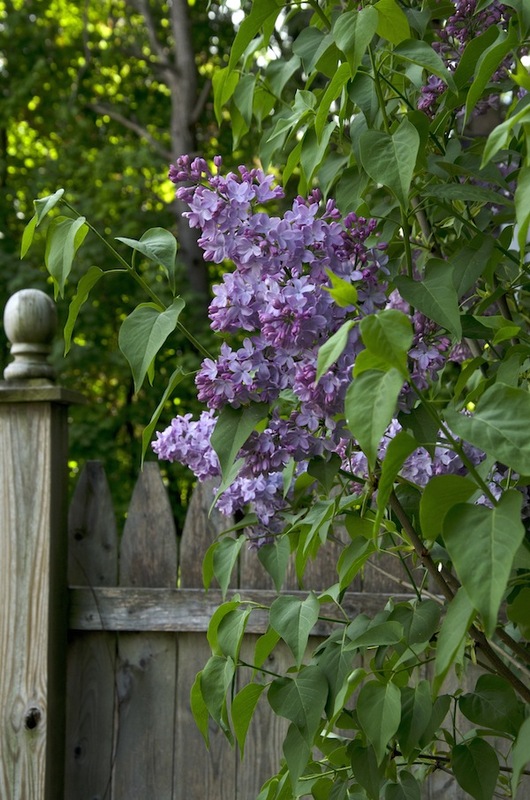 Who isn’t ready for the fragrant blooms of lilacs? 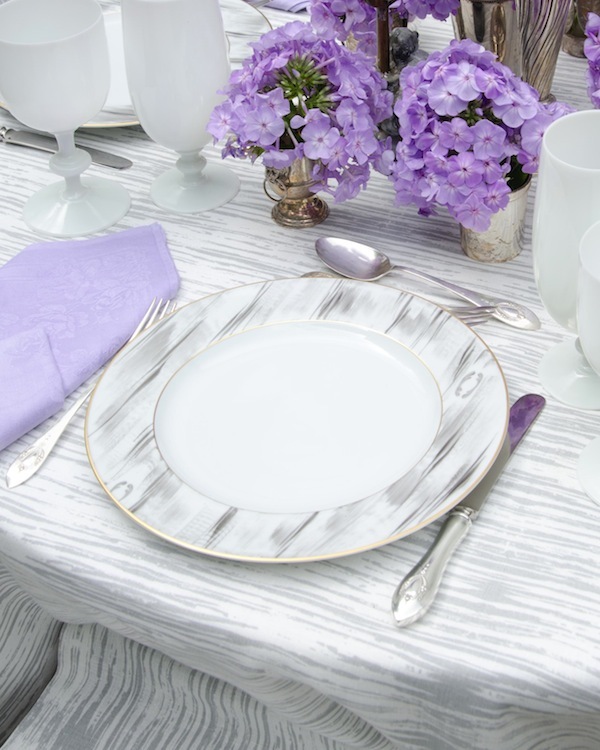 For a festive brunch to welcome spring, Michael commemorated lilac’s Asian heritage with a chinoiserie theme. 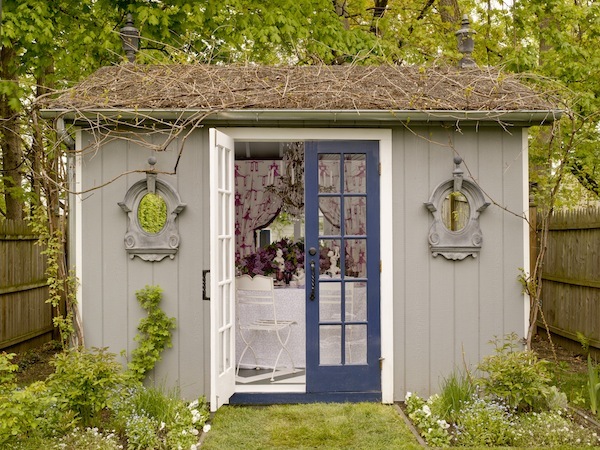 Decorating his thatched roof bagatelle, above, with curtains of his own Garden Folly fabric and his Pinwheel pattern as a tablecloth, he perfectly offset the incredible array of lavenders and violets in the flowers from his garden. Whimsical Mottahedeh porcelain figurines echo the monkeys in the Marie Daâge hand painted Limoges. Michael believes keeping it simple is the key to successful entertaining and relies on classic dishes made with the freshest ingredients, all presented with a certain panache. 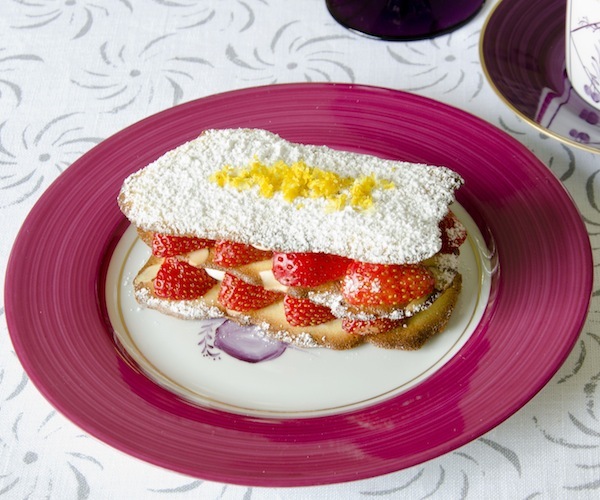 Sorrel, lettuce, chives, mint and rhubarb from his garden inspired a menu including a spring sorrel and salmon tart, green salad and a delectable strawberry mille-feuilles. 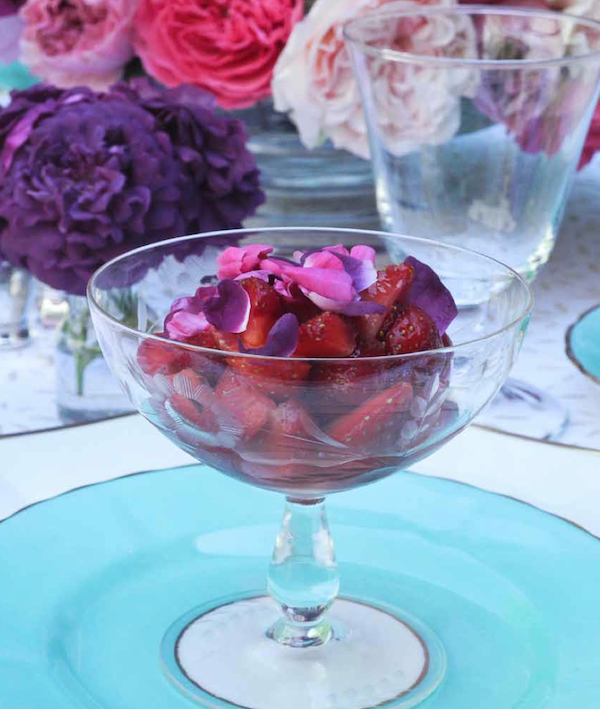 Michael’s garden provides constant inspiration such as a rose pink breakfast where the creative inclusion of rose water syrup and delicate petals infuse a pretty coupe of fresh strawberries. 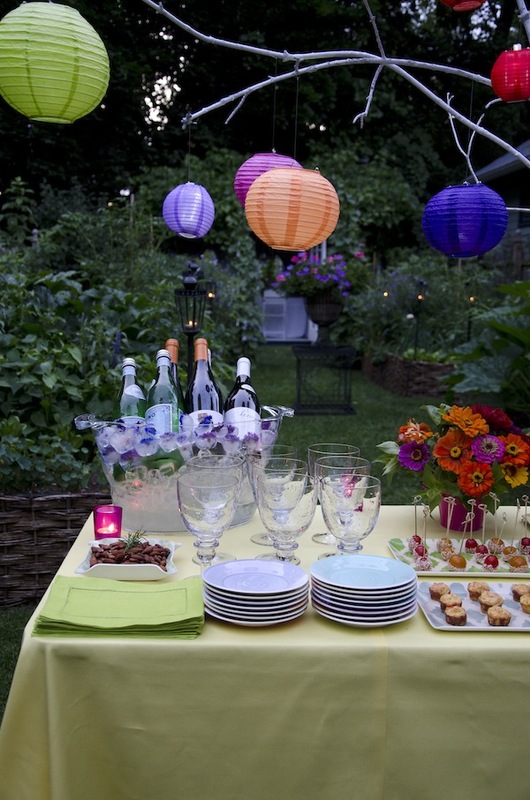 For a summer drinks party, Michael fashioned a festive table with a centerpiece of colorful lit lanterns, cleverly fitted with LED battery votives. 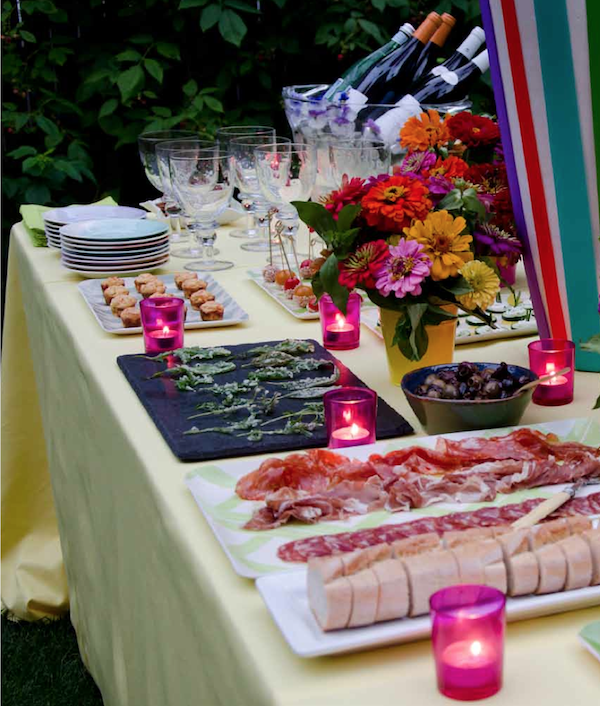 Sophisticated finger food, from tempura fried herbs to an artfully arranged charcuterie, eliminate the need for flatware. Having studied at the Sorbonne, the Ecole du Louvre and the Ritz Escoffier, Michael makes annual pilgrimages to Paris. 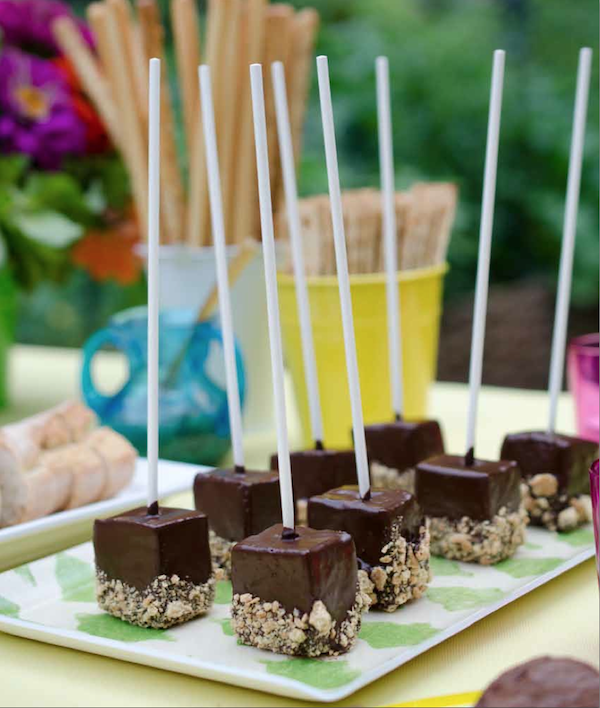 The local patisseries sparked the idea for his fun chocolate covered marshmallow pops and orange chocolate heart shaped brownies. But it isn’t just summer pleasures celebrated in the book. Michael shares ideas for all four seasons including a stunning Dr. Zhivago inspired winter dinner that would obviously be perfectly appropriate now. For the icy palette, he printed his Thomas fabric, one of my favorites, in gray for a wintery effect. 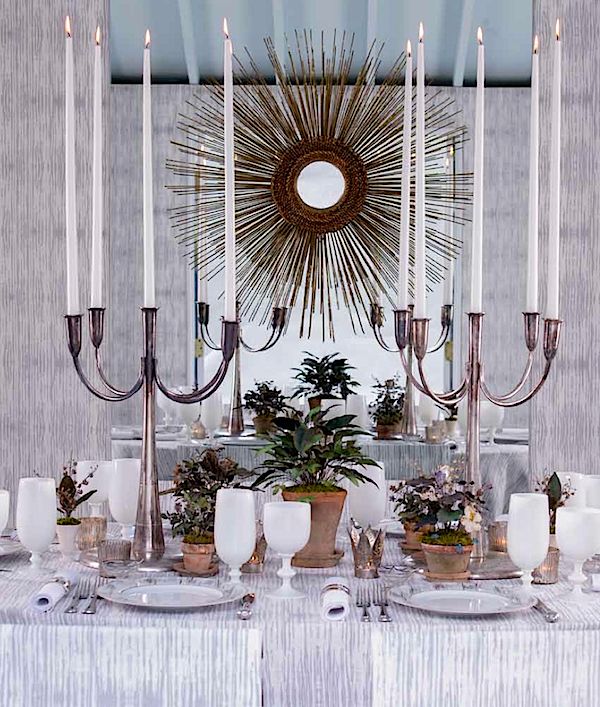 Layered with his new Thomas dinnerware, Vintage Italian silver-plated candelabras and white French opaline goblets, a creamy white blanquette de veau completes the elegant winter wonderland. With a dearth of fresh garden blooms to choose from at this time of year, Michael cleverly created a centerpiece from antique German metal leaves and flowers found at the Brimfield flea market. 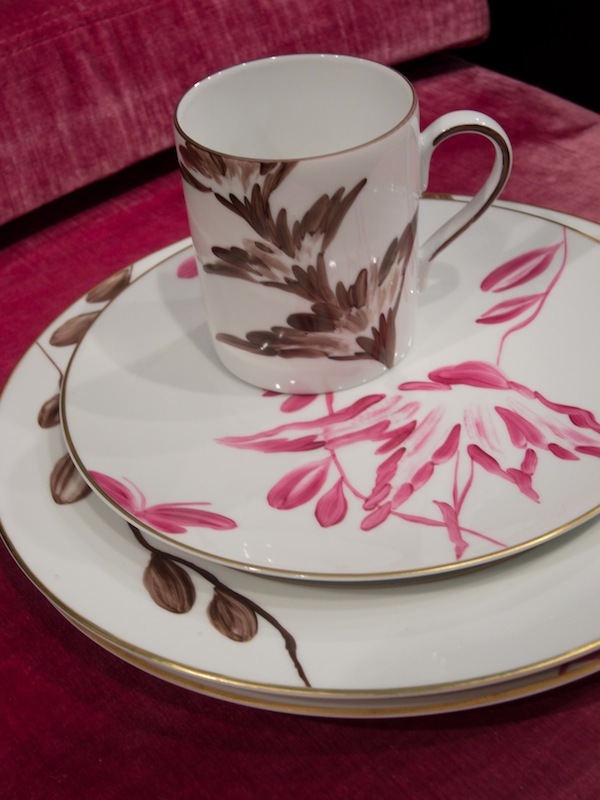 While many of you may be familiar with Michael’s chic fabric line, some may not know of his beautiful new Limoges dinnerware. 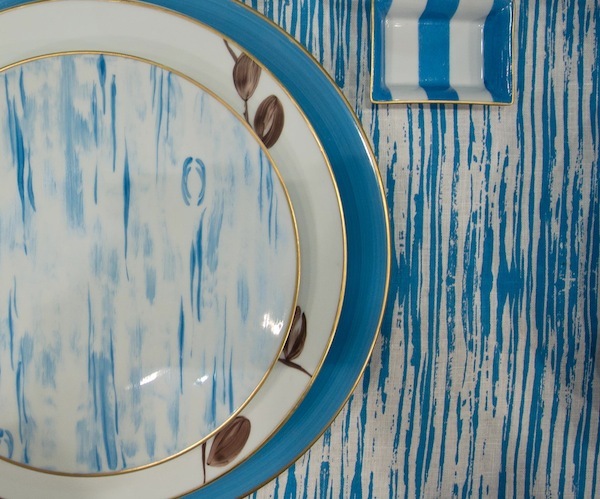 As seen in the Dr. Zhivago dinner and above in a variation on the theme, his first collection, aptly named Thomas, is an interpretation of his fabric of the same name, hand painted in France by Marie Daâge. In four delicious colorways, it is almost impossible to pick a favorite. 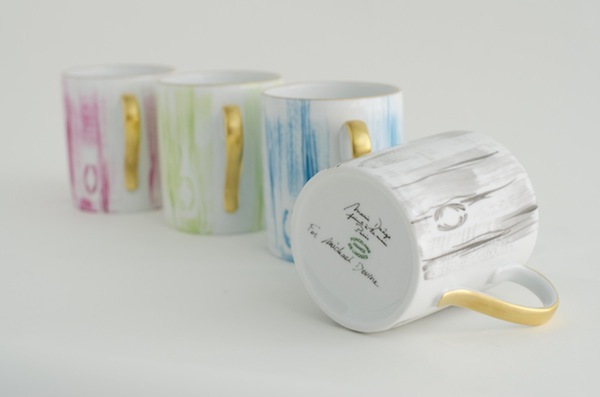 Although with a set of mugs or teacups, you could enjoy all four. a new collection that is the perfect way to mix and match. I am already plotting several dinners from Michael’s delightful new book and may just have to add a few new pieces to my never-ending tabletop collection to complete the picture. This entry posted in food and drink, garden, interior design. Entry Tags: cooking, Entertaining, entertaining books, Gardens, interior design, Michael Devine Bookmark the permalink. The decor, the table setting, the mouth-watering dishes, the personal touch to the crockery, each and every thing is enchanting, spectacular and well coordinated . Loved the pics and the post. Beautiful inclusion of natural beauty with stylish decor! Thank you. This is just what I needed to see today after yet another snow storm. Even though I don’t see any signs of Spring , I can live vicariously through these gorgeous images. Love seeing you here! Don’t you love love love this blog!? How lovely! A summer garden party in the dead of winter. I don’t know what I would like more, a copy of the book with so much inspiration, or a set of one of his gorgeous dinnerware collections. Of course I need more books and more dishes like a hole in the head, but really can you have enough of either? Stacey, Michael is so inspiring with his enchanting Springtime decor. I love his new dinnerware collections! Just what my snow bleary eyes needed Q. Thanks for sharing these gorgeous photos…They will be adapted into my Polyvore sets as always! As always a feast for the eyes Stacey!… Adore lilacs and those en masse on the table look positively divine! Thank you! 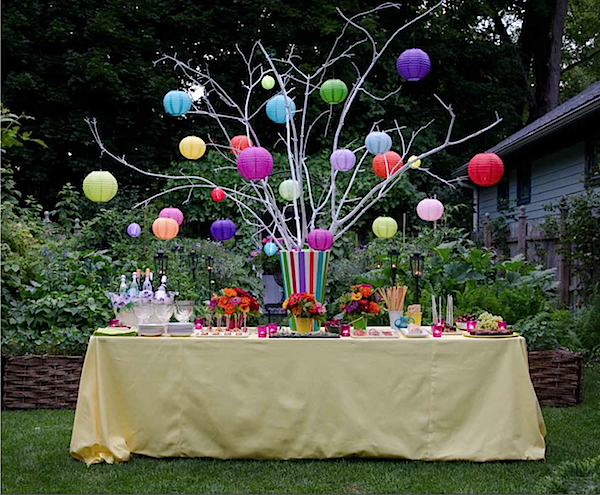 Where did you get the vase and branches to hold the led bubble lanterns? Gorgeous!